Today, architecture in China is at a watershed. Over the last decade, rapid urbanisation and the burgeoning economy turned the country into a playground for the world’s signature architects, making it possible to realise extravagant forms and structures at a vast scale. The Chinese government has now drawn a line under this phenomenon by issuing a directive calling an end to the ‘oversized, xenocentric, weird’ buildings devoid of character or cultural heritage that have sprung up across the country, requiring that urban architecture be 'suitable, economic, green and pleasing to the eye'. This government directive comes at a time when homegrown architecture has become increasingly self-assured and reflective in its approach. 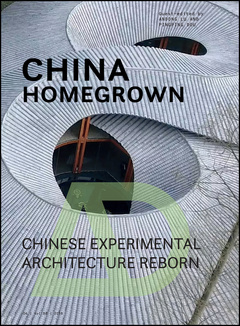 A new generation of architects in China in their 30s and 40s are emerging, and in a wholly contemporary way they are exploring local responses to often bewildering urban and rural conditions and serious social and environmental challenges. This is often expressed through a revival of interest in traditional street patterns, courtyards and gardens. At the same time, architects are also recognising the opportunities to harness the potential of China’s established manufacturing base to develop prefabricated building systems. Innovative practices are employing new modes of working, such as research-based studio teaching and exhibitions, field workshops, cross-disciplinary collaboration, laboratory-based practice, design think-tanks and collective projects, generating a vibrant culture of design research. Andong Lu is Professor of Urbanism and Architectural Theory at Nanjing University and a Fellow of Wolfson College, Cambridge. He has also been a Guest Professor at Dessau Institute of Architecture (2011-12). He has written widely on the subjects of Chinese urbanism, gardens and cinema. Pingping Dou is Associate Professor in the School of Architecture and Urban Planning at Nanjing University and Principal Architect of LanD Studio. She holds a PhD in Architecture and Urban Studies from Queens’ College, Cambridge University and has practiced at RMJM in London.